June 15th may be over, but Magna Carta festivities certainly are far from over! There are Magna Carta events on this year and in London, we’re lucky to have several of them. If you’re passing through the city and want something to do that is very quick, free, and historical, check out this great little exhibit at Burlington House hosted by the Society of Antiquaries of London. The Society was founded in 1707 as a safe space to house historical documents and other important objects. The Society was fortunate to have received 3 copies of the Magna Carta by donation. They will be display for the rest of July. The exhibit is limited to 2 rooms – in the first room, there is a brief video, a few minutes long that tells the history of the document and a little bit about the 3 copies found here. It’s narrated by Professor Stephen Church of the University of East Anglia, a well known scholar of the Magna Carta who has written books on the topic such as, King John: England, Magna Carta and the Making of a Tyrant , and King John: And the Road to Magna Carta . It’s a good introductory video to the background of Magna Carta and the 3 pieces you are about to see. 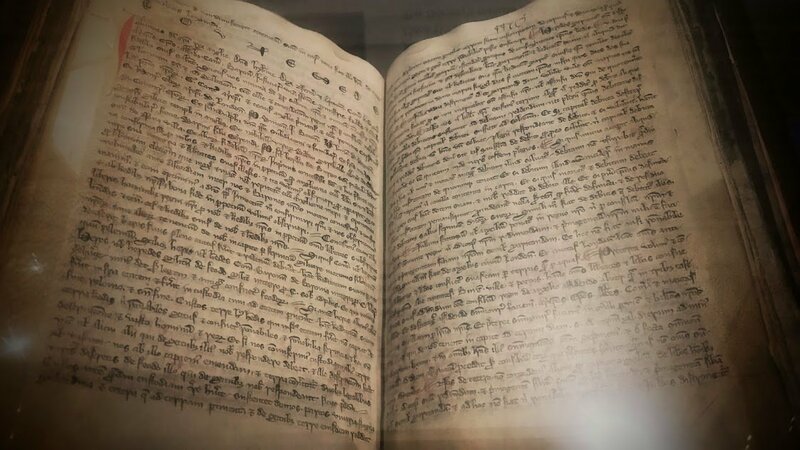 A cartulary dating from the 13th c. contained what might be a discarded version of the Magna Carta, along with other information about Peterborough Abby. The original 1215 document was lost but reproduced in the late 13th century. The cartulary was then passed onto the Cecil family until it was turned over to the Society of Antiquaries of London in 1778 of safe keeping. This beautiful scroll is thought to be the 1225 copy of the Magna Carta that was reissued by Henry III, and it’s believed to have come from Halesowen Abbey. The abbey was founded by Peter des Roches, a major player in Henry III’s reign so it is probably the reason for the monks of the abbey to have made their own copy of Magna Carta. It was kindly donated by the Lyttelton family in 1765 by prominent Society member, Charles Lyttelton. The book contains a copy of Henry III’s 1225 Magna Carta and a Charter of the Forest. These statute books were used by lawyers for study. The book was donated to the Society by solicitor, William Henry Hart in 1862. Included in this section of the display are two 16th copies of the Magna Carta, one from Richard Pynson, who produced the first printed copy of the Magna Carta in 1508, and another volume from Robert Redman, who gave us the first English version of the charter in 1534. The exhibit will run until July 31st, Monday – Friday. You can walk from Green Park station a few minutes to Burlington House.